My last post on this blog was on Valentines Day, 2013, over 4 years ago. When I started this project in 2010, I thought it would take me about 3 years to finish. And it probably would have if I hadn’t had my mother pass away, had my marriage fall apart, moved 3 times in 4 years, and found a new soul mate who I married almost a year ago. That kind of change, both wonderful and grueling, has made it hard to focus on this project. But I’m back and ready to start jamming again. 15 solos down and only 10 more to go. 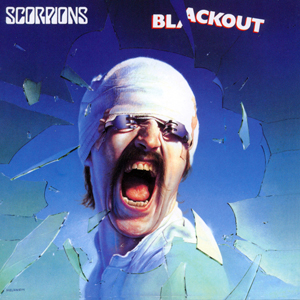 In 1982, the Scorpions released Blackout, a fairly unremarkable album with the exception of the hit single “No One Like You” that starts with a mesmerizing guitar intro that’s instantly memorable. Like many 14-year-old boys, I used to play air guitar to that song, long before I ever picked up an electric guitar, and during my years playing lead guitar for my band, I would still air guitar that solo whenever it came on the radio, even though I never got to the skill level where I could play the lead part from that song. As surprising as it may sound, my Scorpions air guitar fantasy was a big part of why I became a lead guitarist, and I always hoped that someday I would learn it. There are certain solos that were always going to be on my 25 solos list, like We Will Rock You because they are such iconic rock solos, and this one is one of those that was never in doubt. The guitarist who laid down that classic solo was Matthias Jabs, a technical wizard who played those instantly recognizable licks on this instantly recognizable Gibson Explorer. It’s a 24-fret guitar, which allows him to easily hit those super high notes, unlike my 22-fret Les Paul. I confess that I’ve already spent a bit of time working on the solo, and it’s every bit as difficult as I imagined, but I’ve gotten far enough that I can see that I will be able to play it, if not with total mastery, at least to a level I would feel comfortable performing it on stage. and a here’s a live version of the song from 1985, that shows Matthias’ precise guitar work. I’m doing the solo that starts at about 2:50 in the song. Wish me luck getting back in the swing.